Ophiuchus from Urania's Mirror, courtesy Wikipedia. 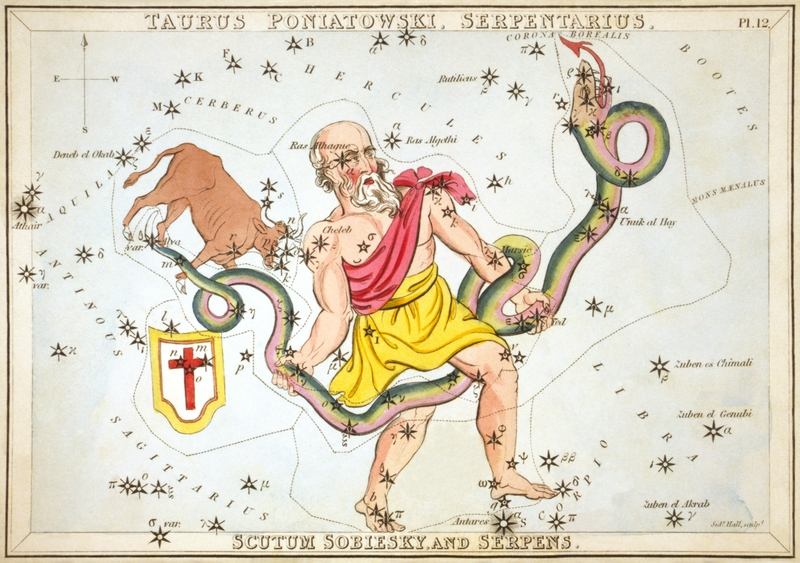 There's a lot of hullabaloo on the web right now with respect to an article from NASA that claims that the zodiac has changed and that there is a heretofore unaccounted 13th sign, Ophiuchus. This all supposedly throws astrology into chaos and plants a final nail into its coffin as anything but charlatanism. The truth is this, and I can't state this emphatically enough: Astrology has known about the precession of the equinoxes and the constellation of Ophiuchus for thousands of years. There's nothing new here, nothing has changed, your sign is still your sign, and NASA is, in actual fact, wrong. In Western astrology, the signs are not the constellations. Signs are spacial divisions of 30 degrees across the path of the solar ecliptic, starting at the point where the Sun rises on the Spring Equinox. Thus, the first day of Spring is always Aries. Today the Sun no longer rises in the constellation of Aries as it did in Babylonian times, but now rises near the beginning of Aquarius, hence the term Age of Aquarius. This means that for the next 2200 years Aquarius will meet the first day of Spring rather than Pisces (past 2200 years) or Aries (2200 years before that). Again, astrologers have known this for millennia, and even beginning students of astrology are aware of it. Some NASA astronomers evidently have yet to catch up. It is worth noting that astronomers who dismiss astrology out of hand, such as science stars Bill Nye, Neil Degrasse Tyson and Carl Sagan, are almost always basing their judgments on newspaper horoscopes and other popularized ideas about astrology that are in fact incorrect and charlatan. I can't prove this but I strongly suspect none of those men, nor most scientists who bash astrology, have ever picked up an astrology book, studied the discipline and practiced it for themselves to see whether it works or not. If they had, they would be astonished and have to rethink their whole orientation towards the nature of the Universe (something all astrologers go through when they realize astrology's undeniably real effects). When Copernicus, Galileo, Newton, Kepler and even Einstein were crafting their theories of the nature of the solar system, physics and gravity, they were quite infused with a feeling of being connected to the Divine, that they were in service to Heaven and Earth in revealing to humanity the mechanics of God's Divine Creation (God meant here in a spiritual, transcendent sense, not religious). Astrology was not unknown to them nor was it rejected. We are not taught this, it is considered an anomalous quality of their characters, perhaps an eccentric byproduct of being a genius. But perhaps they actually were in touch with something greater, a higher truth that we are part of a much larger, inconceivably complex picture, where the cycles of human consciousness are inextricably bound together with the movements of the planets and stars. Indeed, astrology gives strong evidence that this is in fact so. For more on the divinatory nature of scientific discovery, please see Richard Tarnas's excellent book on science and astrology, Cosmos & Psyche. What would it mean to humanity as a whole to fully realize and accept that there is a mysterious but ineluctable link between us and the heavens, that the Universe is a synchronized organism where the smallest atom is inherently connected to the largest galaxy? What does it say about our nature, and the nature of creation itself, that meaning and purpose is extant everywhere, not just as a survival byproduct of the human brain? How differently would humanity live and treat itself and the planet if it was common knowledge that each one of us is part of a grand celestial symphony, living our lives in concert with motions of meaning reflected in stars calling out for our recognition of their divine purpose? Astrology is, in no exaggerated terms, a tool for humanity to save itself, because by recognizing our inherent connection to the stars and each other, we can no longer pretend that survival is our only life-motivator, or even the most important. Truth, love, compassion, creativity — these qualities far outweigh mere survival for the purposes of human existence. And our future, as we head into the Aquarian Age, will exonerate this truth for all to see. Astrology is the geometry of space. Since Einstein, there is a general awareness that space is curved, but the implications for the meeting ground of astronomy and psychology (that is, astrology) have not caught up with what we know, in the scientific community especially. Gravity wells (planets, stars, black holes, etc) curve space in on itself and consequently pull us our psychological profiles. We are conditioned, but not controlled by, these tugs and pulls, since the spiritual arts are always about consciously realigning energies such as to dissolve polarities (merge yang and yin into tao); that is, our goal is always the center of the chart, but our tactics for getting there differ according to the ‘constellations’ of energies which our individual charts (destines) describe. Always enjoy your mind bending perspectives, Sa. You are quite the ‘gravity well’ yourself. Not sure who you are, Aries. But I must know you from way back since you call me Sa. Ah, I didn’t know you called yourself Aries. Or me Sa. Truly a magical, more connected world it will be once every soul has awareness of Dreams and the stars (Astrology). My diligent Service is to direct curious attention towards the Most Purposeful sources. Seeing the good in all experiences is the Key to soul evolution so any press is good press, it’s delightfully entertaining to see NASA direct attention to such topics. Well said, MA. Keep those dreams alive!